The Jesuit presence in Sicily hasn't always enjoyed the support of the Crown. In 1767 the religious order, which had arrived in 1549 when Sicily was ruled from Spain - the Jesuits' place of foundation - was actually expelled, to return a few decades later with a shadow of its former wealth and power. By then the Inquisition the Jesuits had generally supported was a thing of the past. Power and politics aside, the Society of Jesus (the order's official name) was never Sicily's most important monastic order. That distinction belonged to the Benedictines and then the Dominicans. But the Jesuits did leave a particularly distinctive legacy in Sicily: Casa Professa. The church, officially the "Chiesa del Gesù," is pure Baroque. 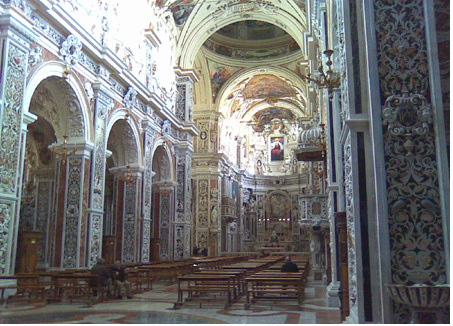 Architectural historians reluctant to recognise it as pure "Sicilian Baroque" nevertheless concede that it is one of the most remarkable churches of its kind south of Rome, rivalled in the central Mediterranean only by the cathedral of Saint John in Valletta, Malta. Casa Professa was the Jesuits' conventual seat in western Sicily, and they had several other monasteries around the island and in the city of Palermo. Its unique decoration features intricate intarsia (stone inlay), boldly colourful paintings (many recently restored), and a few sculptures by Gioacchino Vitagliano based on models by Serpotta. Construction began in 1590 and wasn't completed until 1636. The church was constructed on the edge of what, until 1493, had been the city's Jewish Quarter. Near what is now Via Meschita, a few blocks away, stood a large synagogue. It seems that parts of the Jesuit monastery, and perhaps the church itself, were built upon an important Judaic school or meeting place, though this is far from certain. A few steps away, the Ballarò street market has been present since the Middle Ages - possibly since the tenth century. Indeed, Casa Professa is one of the newer public structures in this district. Several architects, led by Giovanni Tristano and Natale Masuccio, as well as hundreds of artists and artisans, assisted in the church's construction. An extensive restoration was completed in 2009. Only in the apse is there a window of stained glass, and it is a recent addition. Colored light would be a distraction from the ornate ornamentation of churches in this style. The recently-created paintings are probably brighter than the originals and in that sense are almost aoverwhelming, though each is beautiful in itself. For most people, the Baroque is a style either immediately appealing or oddly repulsive. There seems to be no middle ground, no neutral grey area. If you love the Baroque, don't pass up a chance to visit this church. Parts of the original monastic complex now form the city's public library and student dormitories of the University of Palermo. Owing to the dearth of seminarians, the Jesuit monastery is now quite small. Casa Professa is located near the Quattro Canti, a short walk from San Cataldo and the Martorana. For an unusual view, stand at the squared archway at the end of either row of small chapels flanking the nave and face the apse and high altar. You'll see each chapel's arch framing the one beyond it. A Heavenly impression.